Along with thousands of our customers, at Harrod Horticultural we're passionate about the organic growing of fruit and vegetables and believe that this magical experience shouldn't pass by the children of today. Every child should grow up knowing what good food is, where it comes from and how to grow it themselves. It's a journey they'll never forget and many could walk out of your school as the gardeners of tomorrow. The school holidays may have come to a close, but a school gardening project is just the thing to excite your school or class this year. There is never a dull moment with lots of fun learning and tasks to do. The Autumn term is all about harvesting the delicious crops you have grown, sowing for winter plants, making plans for Spring growing, tidying up, creating winter homes for beneficial insects, etc. 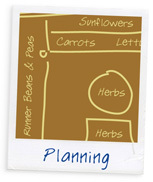 Here’s just a few ideas to get your pupils involved and there is much more to discover at www.buddinggardeners.co.uk. 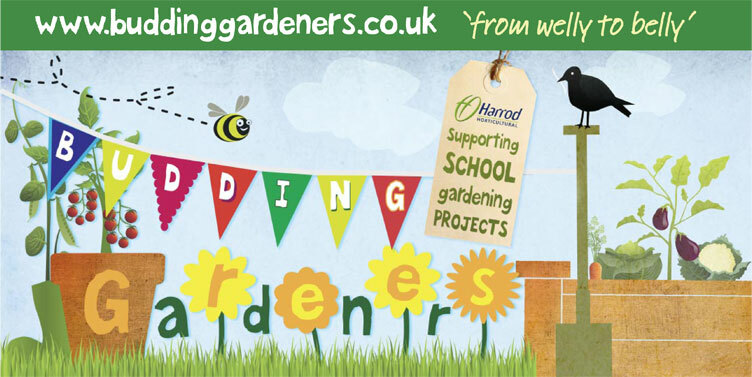 Don’t forget to use your special school discounts to help the purchase of any equipment you might need from www.harrodhorticultural.com, we hope you find it of grea	t support over the next school year. 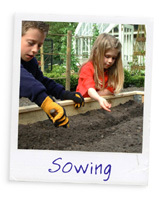 By sowing and planting at the right time, you can be harvesting all year round, using the Budding Gardener Childrens Tools espcially designed for young gardeners. 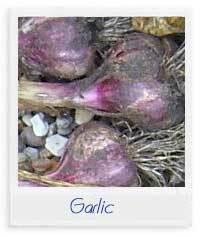 If there is time in your programme, consider winter crops like Autumn Onions, Garlic and winter lettuce. Otherwise start thinking of Spring growing now, what you should grow in and where you should grow a variety of root crops, leafy vegetables and salads too. Think about your space, position of the plot and the type of soil whilst children could help to decide on the varieties. If your soil is poor quality think about installing some raised beds and Rolawn topsoil to give your seedlings the best possible start. Pupils could plan different raised bed designs and layouts to maximise the return from the available growing space and therefore maximise enthusiasm! The key to any well run project is planning. Now’s the time to start thinking about the time frame of your project, the positioning and layout of the crops selected, the jobs involved and who is going to do them, putting together a list of equipment required, etc. Keep the children involved in as much of the planning as possible to give them the sense of project ownership and the experience of project management. Work together with the school canteen to plant fruit trees, providing delicious dessert and snack ingredients for future pupils. An orchard area with long grass will encourage beneficial insects into your garden. Beneficial insects such as ladybirds, lacewings, hoverflies and bees are essential to the success of any crops as they aid pollination and feed on aphids, reducing aphid attacks. 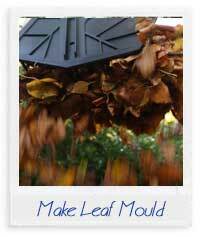 Everything about leaf mould is great. Why? Well, it’s easy to make; it cuts down the need to use peat; there’s no need to have bonfires and best of all – it’s free! All you need is a simple container (making one could be a fun project) which will stop the leaves blowing away, a plentiful supply of fallen leaves and a band of willing helpers (the last two are not normally a problem!) You’ll also need a bit of patience as the leaves can take up to 12 months to turn into a suitable soil enhancer and if you can hang on for a couple of years, you’ll end up with a material you can use in seed sowing and potting mixes as well. Make yourselves popular with the school kitchen by preparing and planting garlic - its a great hands-on activity and which you can tailor to the weather and it’s a great way of following a crop through its entire life as the children can add the mature cloves to dishes next spring or summer!. Splitting the cloves can be a classroom task and planting out on a crisp sunny day will keep the pupils warm and retain interest in the garden. 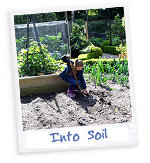 Older pupils may be interested in soil stratification and why it’s important to plant the cloves the correct way up but whatever the age of your class, winter planting keeps interest in the garden alive. After all the hard work and excitement of growing and harvesting your crops, it’s such a shame when they rot or become diseased in store. Store apples in single or stackable apple racks or vegetables in these handy storage bags with blackout lining Taking care when preparing fruit and vegetables for storage is essential to avoid this unfortunate scenario, and almost as important is regularly checking for developing rots or the onset of diseases. Why not split the class into groups and draw up a rota for checking? If you are unfortunate enough to discover something unpleasant growing on the fruit and vegetables, try to identify what it is, how it develops and how to prevent it – in our experience, children are spellbound by the sight, smell and growth of fungus! A good compost heap is essential to any gardener seeking to garden without using chemicals. All the ingredients are easily found in the garden, the kitchen, even the classroom! Use twiggy and leafy material, shredded paper and grass clippings and add to throughout the winter. The compost is ready for use when it is a nice dark brown colour, with a fine crumbly texture. During the winter your greenhouse becomes your most valuable asset on your plot - and lining the structure with greenhouse bubble wrap can save you money and keep tender plants alive. Bubble insulation that is UV stabilised as well as tri-laminated is best; the UV treatment will stop the bubble wrap from becoming hard and crispy, allowing you to use it winter after winter, whilst the tri-laminated version is harder-wearing and will help retain more of the day's heat. Older children can calculate how much bubble insulation is needed by measuring the greenhouse size. 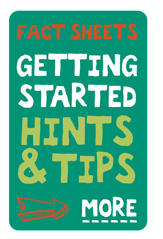 A general size guide can be found here under the “Help and Advice” tab. Finally, make the most of any dreary Autumn days and gather everyone round a computer to plan for next year with the help of www.buddinggardeners.co.uk and www.harrodhorticultural.com Who knows - you might even treat the class – and garden - to an early Christmas present using our special schools discount! December is a good month to start plowing (pardon the pun!) 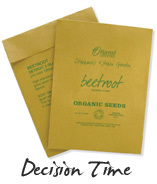 through seed catalogues, deciding what you’d like to start growing in the spring, and making a list. Harrod Horticultural have a variety of planters and raised beds , large or small, raised or flat, ideal for school gardening. Decide how the school gardening club would like the garden to look once in full bloom and which planters and raised bed designs will look best. When Spring is in the air, depending on your region, you may notice the first signs of Snowdrops, Crocus, and Daffodils as they begin to flower. To get a jump start on the growing season, consider sowing something hardy like early peas or beetroot; these can be sown directly outside if you can work your soil with childrens tools once the temperature begins to rise, or start some lettuce or broad beans indoors. Sprout potatoes to plant next month in egg cartons that the children have brought into school with them; early varieties should crop before the end of the summer term, main crop varieties will not be ready until September. It is advisable to check the soil temperature outdoors about 1 week before you sow; the ideal temperature is 5 degrees C or more. Check that your propagators are working correctly before using them for the new season, ensuring a constant background temperature for best results; this again can be checked with a thermometer. During Winter most plants are dormant, or need very little attention, so focus on caring for garden hardware such as tools, fences, raised beds, and sheds; if ‘oldies’ can’t be mended or recycled, purchase ‘newbie’s’. A leaf ‘clear up’ would also be an idea in preparation for composting, remembering to check under piles for any hibernating creatures. Shredding the leaves is the best way to kick start them. At www.harrodhorticultural.com you can purchase biodegradable leaf sacks, which are perfect for housing the leaves whilst they slowly break down. In doing this you should be rewarded with lovely textured leaf mould, ideal as a soil improver, lawn conditioner, and mulch. It can also be used in seed and potting mixes too, and is great for all year round use! If the pupils get bored with making Christmas decorations from dried citrus slices, get them started on homes for wildlife; bird boxes, hedgehog houses, and insect hideaways can all be made from scrap materials. Logs piles in the garden provide creatures with their home comforts, and many will repay you by eating those pesky pests in the garden next year! At this time of the year you can expect lots of very small visitors during the Winter months, including mixed flocks of many birds. Encourage these creatures into your garden by regular feeding; this is a very good idea because they are brilliant predator for many garden nasties, and during the harsh winter months they’ll be very appreciative. www.harrodhorticultural.com stock many different types of bird houses, feeders, and specialist foods. Cold, but dry winter days are a good time for digging over the vegetable patch. Turning over the soil exposes insect pests to the birds and winter weather which decreases the possibility of problems emerging later on in the year. It also helps to break up compacted soil with clods being broken down by the effect of rain, frosts and wind. When digging, add in some fertiliser. This will have time to take effect before planting begins. When clearing the ground, make sure all weeds including thistles, dandelions, nettles and couch grass are removed. Every scrap must go as they can re-grow from even the tiniest piece of root. Unlike any vegetable debris you may come across, these should not be added to the compost heap. Days are lengthening and are temperatures rising - the growing season has finally begun! Here are a few more ideas to get your pupils involved. There is much more to discover at www.buddinggardeners.co.uk. 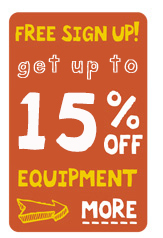 Don't forget to use your special school discounts to help the purchase of any equipment you might need from www.harrodhorticultural.com. We hope you find it of great support during the school year. Sow slow-growing tomatoes and leeks in pots under cover in March. 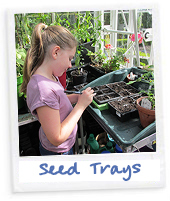 Keep them in a warm place to encourage the seeds to germinate. A propagator can help. When the seedlings have more than two leaves, gently transplant them into bigger pots to grow on. 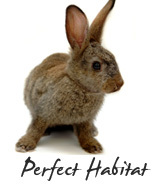 Make arrangements for them to be cared for during the Easter holidays. They will need regular watering and feeding. Tomatoes are hungry plants and quickly use up all the nutrition available from the soil. Sowing starts in earnest in April as the rising temperatures and showers make perfect growing conditions. Apart from beans almost every other type of vegetable can be sown outside with most ready for harvesting by the end of the summer term.Indoors sow chillies, sweet peppers, aubergines and beans. April showers are ideal for giving vegetable crops a head start. 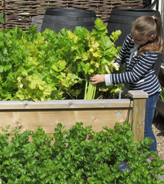 Grow early crops of lettuce, baby beetroot, baby turnips and carrots under cloches or fleece ready for harvesting in late April/May. Put the cloches or fleece on the soil for a few days before planting. This will warm up the soil and encourage germination. Make sure that fleece is well staked down - high winds can quickly remove a fleece and send it flying. Rhubarb plants will be growing strongly and stalks can be cut regularly. 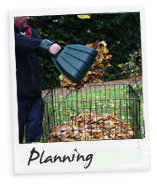 Remove the leaves before using and add these to the compost heap. If planting peas, make sure you protect the soil with insect mesh - mice love digging up and eating the seeds. The ground is warm enough in May for lettuce, radishes and salad leaves to be sown outdoors. Runner bean and French beans can be started at the end of May and preparing support frames will help them to climb. Keep watch on temperatures - they can still plummet at night. Young plants may need some protection, even in May Temperatures can deceive. A warm day can mean low temperatures at night but air frosts are still possible. These will damage tender vegetables such as lettuce and early potatoes. If a frost is forecast, cover the crops with fleece overnight to keep them warm and safe. Also, keep watch for evidence of pests once you begin to plant out. Little nibble marks on seedlings, yellowing leaves or collapsed seedlings can indicate a pest is present. Live pest control is the most effective organic way of removing slugs. Totally safe to use around children pets and wildlife, the nematodes seek out the slugs in the soil to kill them underground. Copper tape, bands or rings are also an effective physical barrier. Beat the garden pests arrival by protecting crops with the ingenious Harrod Slot & Lock® Crop Protection Range which includes raised bed fitted covers, for the simplest raised bed pest control protection. The range also includes vegetable and strawberry cages in two different colours and the vegetable cage in two different heights. There is a walk in cage, stormproof cages, build your own cages, support frames and even a school pond cover to protect against heron attacks! Look out for weed growth and act quickly as weeds take up nutrients and water that can be better used by your vegetable plants. Removing weed seedlings is lot easier than when they have developed into larger plants. Start courgettes and pumpkins in pots, ready for planting out late May. Make sure they are kept warm in a greenhouse or coldframe because they are very tender plants. Watch out for mice - they will eat the seeds if they find them so cover the pots with netting for protection. Now is the time to consider the planters and soil you will use for all your newly planted seedlings. Raised beds are great for school gardening as the soil is contained in a specific area so watering and pest control are easier. You can add soil improver and raised bed liners if you would otherwise be planting in poor soil to begin with. Several 4ft x 4ft raised beds are perfect in size for a school gardening club to plan their crop and harvest and calculate soil requirements. Raised bed capping also provides a small platform to lean against when planting seedlings out. Planters can be raised for wheelchair users and restricted mobility gardeners in the form of manger planters or raised bed tables. These are ideal if your school only has hard standing patio areas on which to garden. 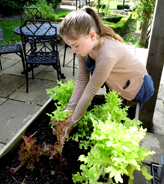 Harvesting is in full swing now the summer months are here and a childrens range of tools are a perfect purchase to enhance the productivity of the gardening club. 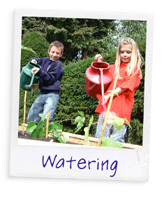 The Budding Gardener Childrens Tools range of tools consists of a Digging Fork and Spade and a Hand Fork and Trowel. Made from strong carbon steel, suitable for children aged 6 and above, they are lightweight and compact in size so are perfect for your school gardening club. Plans need to be put in place to cover holiday watering harvesting and weeding. As you harvest, fill the empty plot areas with plug plants from the greenhouse so you have crops to harvest in September. The summer months are a great time to recruit new gardening club members for the following term and work with the school kitchen to plan recipes and make use of harvesting gluts! June is the time to harvest baby beetroot, radishes, the first carrots, peas and potatoes. Strawberries will be ripe so start picking before the birds reach them! Protect your strawberries and other crops ready to harvest with crop protection hoops and netting so the gardening club get to eat the produce instead of the local wildlife. Lettuces and mixed salads can be harvested too before they bolt or flower and can be replaced with new salad seed for a regular supply. By July harvesting is in full swing as the vegetable plots are crammed to capacity. Peas, runner beans and French beans need picking every couple of days. They will be giving large crops now with pretty flowers appearing followed quickly by beans. Other early summer crops which should be ready for harvesting include spring onions, beetroot, courgettes, salads, tomatoes, potatoes and of course – more strawberries. Plant out courgettes, pumpkins, squashes in June. Squashes and cucumbers will need a support frame to trail up and along. They will grow swiftly and the first courgettes should be ready within a few weeks. Any French or Runner beans grown in pots should be planted out now. Tie them into a pea support frame and then leave them to grow. They will need no further tying in, as they will twine around the supports. Seedlings are now big enough to plant out in planters with freshly delivered soil. Raised beds are great for school gardening as the soil is contained in a specific area so watering and pest control are easier. You can add soil improver and raised bed liners if you would otherwise be planting in poor soil to begin with. Several 4ft x 4ft raised beds are perfect in size for a school gardening club to plan their crop and harvest and calculate soil requirements. Raised bed capping also provides a small platform to lean against when planting seedlings out. Planters can be raised for wheelchair users and restricted mobility gardeners in the form of manger planters or raised bed tables. These are ideal if your school only has hard standing patio areas on which to garden. Keep a careful watch on growing vegetables during dry spells. Be prepared to water everything if no rain is forecast and look out for signs of wilting or dying leaves. Soak the earth thoroughly around each group of plants. A light watering is not enough, water butts, soaker hose kits and water timers can really help make holiday watering a lot easier and less manual for younger children. Keep weeds at bay by filling gaps in the corner of your beds from where crops like potatoes have been dug up. Sowing more salad leaves, beetroot, turnips, lettuce and rocket is perfect in July and they should be ready in time for September. Remain vigilant for pests, little nibble marks on seedlings, yellowing leaves or collapsed seedlings can indicate a pest is present. Live pest control is the most effective organic way of removing slugs. Totally safe to use around children, pets and wildlife, the nematodes seek out the slugs in the soil to kill them underground. Copper tape, bands or rings are also an effective physical barrier. Beat the garden pests arrival by protecting crops with the ingenious Harrod Slot & Lock® Crop Protection Range which includes raised bed fitted covers, for the simplest raised bed pest control protection. The range also includes vegetable and strawberry cages in two different colours and the vegetable cage in two different heights. There is a walk in cage, stormproof cages, build your own cages, support frames and even a school pond cover to protect against heron attacks! If your garden project runs through the summer, then a visit once or twice a week will keep outside gardens in reasonable condition until school returns in September. Think about weeding well before going on holiday, mulch plants well to keep them moist, keep harvesting and if possible establish a roster of holiday teams. Keep up with the weeding throughout the summer holidays, mulch plants well to keep them moist, keep harvesting and if possible assign the holiday teams to weed and water. What comments do you have about the content of our website? 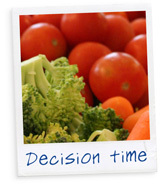 The website is very easy to navigate and has useful links to related products. It’s clear and easy to use and the staff are very helpful. Very bright, great design for school use. Lots of helpful information. There seems to be a lot of advice and options to purchase all we need. It is easy to navigate around and is attractive. Great! Love it! Better than RHS! We have used it before and it has been very helpful. Easy to use and good range of resources. Clear, easy to navigate, very informative. Very informative. 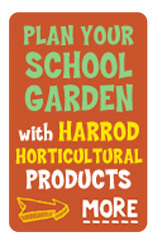 Followed a link from RHS campaign for school gardening website. Some good project ideas not found on their website. Clearly laid out and easy to follow links.